Ten years ago, I had my Brandon 130-mm f/8 apochromatic refractor mounted on an early 1950s Unitron equatorial mount equipped with a mechanical Polarex clock drive. The mount was big, heavy and bulky, and the clock drive was at best cranky (pun intended!). It was a curiosity at star parties, but the Unitron was also a maintenance hog, needing continual lubrication and subject to wear and breakage of the weight drive cable that powered the device. Although fun to watch in action, with the weight descending, rotating gimbals and spinning flywheels, the Unitron mount was ancient, cumbersome, and labor-intensive to use. On top of all that, it really didn’t track that well. It’s hard to believe the 1950s advertisements touting this mount as photographic ready! I replaced the ancient Unitron with a Vixen Sphinx SXW, chosen because of its high quality, portability and high-tech capabilities. I have used this mount for several years now, with the 130-mm apo and SXW an excellent performing combination. The Star Book GoTo system has been a joy to use and invaluable in locating deep-sky objects in an efficient and precise manner. With my old Unitron mount, I would average three or four objects observed per night. With the Vixen SXW and Star Book, I now observe between ten to fifteen deep-sky objects on an average night. I’ve actually peaked at 25 deep-sky and planet observations during an exceptional evening. I became the local Washington, D.C. expert on using Vixen mounts, often receiving evening phone calls to field questions about setting up the Sphinx mount and operating the Star Book controller. In 2015, I decided to write a book, The Vixen Star Book Users Guide (Springer – The Patrick Moore Practical Astronomy Series) to publish my lessons learned. By this time, the Vixen had replaced the venerable SXW with a new revised model, the Vixen SX2. This was an opportunity for me to directly compare the second-generation Sphinx mount with its predecessor. The SX2 uses the same physical housing as the older SXW mount, but all of its electronics have been 100 percent updated. Quieter digital stepping motors in the SX2 have replaced the original DC servo motors of the SXW, providing smooth, quiet slewing with quick response to commands. Designed for a load capacity of 26.4 pounds, the SX2 only weighs 27 pounds. Its low weight enables the SX2 to be a very portable equatorial mount, ideal for both field use and at home. The axis shafts are aluminum alloy, and aluminum gears are used for the drive system. Common to both generations of Sphinx mounts is the unique internal placement of the right ascension (RA) and declination (DEC) motors. This internal location of the motors, electronics, and gears within the declination housing of the Sphinx mount acts as a built-in counterweight. The amount of actual counterweight used to balance the mount with its telescope is less, resulting in an overall lighter and more portable equatorial mount. All wiring for the RA and DEC motors are also internal, achieving a clutter-free telescope setup with the cast housing also offering protection for the electronics, gearing, and motors. Both my SX2 and SXW mounts use the Vixen HAL-130 aluminum tripod. This tripod is highly stable, vibration-free, and in keeping with the portable weight-saving philosophy of Vixen, weighs only 12 pounds. Two hand controllers are available for the SX2. The simple Star Book One is only a RA/DEC hand control and is available for the budget conscious. The more capable and more powerful Star Book TEN is the real choice for use with the SX2. The Star Book TEN (Image 2) represents the latest, most powerful, most capable, and the most current of the Star Book series of Vixen’s GoTo computer controllers for the Sphinx line of equatorial mounts. TEN in Japanese means “The Heavens,” and is not any reference to the version number of the software or hardware. Designed specifically to drive the new stepper pulse motors that operate at 250 pulses per second (pps), the Star Book TEN provides smooth, quiet, and accurate movement of the Sphinx mount. Additionally, periodic error correction and backlash compensation have been included as part of the Star Book TEN virtues, not previously available in previous iterations of the Vixen controller. A frequently asked question is: Can an owner of an older first-generation Sphinx mount with an original Star Book (Image 3) upgrade his/her Sphinx mount with a Star Book TEN? The simple answer is no. Since the Star Book TEN is designed to drive pulse motors instead of the original Sphinx DC servo drive motors, the Star Book TEN controller cannot be substituted for the original Star Book used on the original Sphinx mounts. The Star Book TEN, the motherboard within the new Sphinx mounts, bearing design, gear design, and the stepper pulse motors are designed as a system. There is no Vixen update kit available for the older mounts, since the labor and the skills needed for making such an upgrade is most likely beyond the average owner’s capability, and if installed improperly can easily compromise the mount’s performance. Such an upgrade would result in a major rebuild of the mounts, with the cost of parts and labor likely exceeding the cost of buying a new Sphinx mount! The Star Book TEN plugs into the Sphinx mount through a nine-wire cable with D-SUB9PIN male connectors at both ends. The female connection port for the controller cable is located near the counterbalance bar of the Sphinx mount on the underside of the declination housing. The power supply plug and the On/Off switch are in the same location. A reliable source of 12 volts is needed to power the mount, using either a portable battery or an optional Vixen 12-volt power supply. Users of other GoTo systems will find the Star Book TEN operation very different from their previous experiences. There is less reliance by the user on stacks of star charts and volumes of celestial catalogs with the Star Book TEN. The problems associated with searching through a star chart or astronomy book at night with a dim red flashlight are no more. 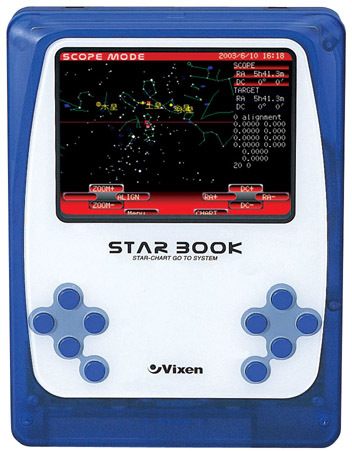 The Star Book TEN 5-inch, 800×480-pixel screen is used to great advantage by displaying the planetarium view of the night sky while providing precision electronic control of the telescope and mount system. GoTo searches with the Star Book TEN can be accomplished in two different ways, either using the pull down menus offering selections of planets, stars, and deep-sky objects, or just by simply lining up the crosshairs on the Star Book TEN display on a star or object and selecting GoTo. When in use, there are two ways to hold the Star Book TEN. Users transitioning from the original Star Book to the Star Book TEN will most likely adopt the two-handed approach, holding the controller much in the same way as holding an Xbox or PlayStation hand control, manipulating the keys using their thumbs. The new ergonomics of the Star Book TEN also supports holding the device with one hand while operating the keys with the second hand, much like using an iPad or Android tablet computer. Either method works well, and is up to the user’s comfort. The Star Book Ten has an optional expansion module called the “Advance Unit” by Vixen (Image 4). This accessory attaches internally in the base of the Star Book TEN and is compatible with the Star Book TEN only. 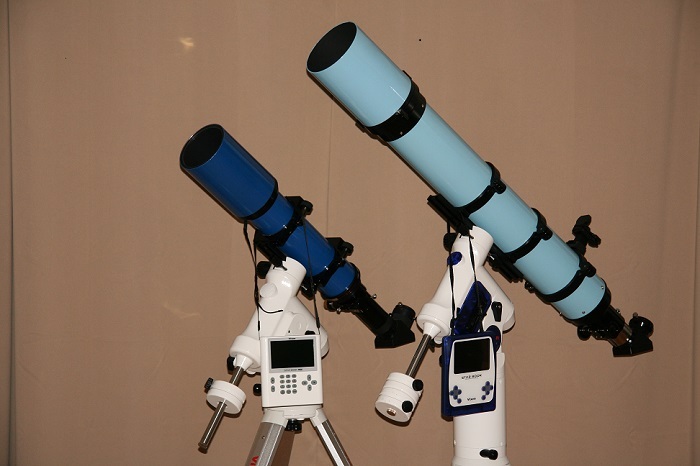 The Advance Unit facilitates the use of a CCD autoguider to allow for astrophotography. The Advance Unit also allows for video images from an analog NTSC audio-visual signal to be displayed on the Star Book TEN display screen. 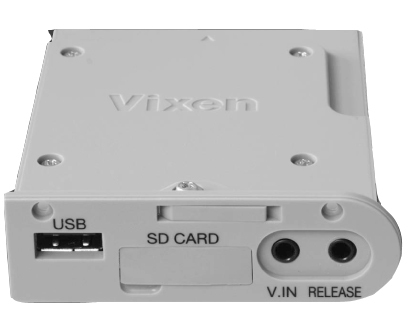 Vixen has provided an SD or SDHC memory card slot on the Advance Unit for recording and saving the video images. Additionally, remote shutter release control of a DSLR camera is possible. The Advance Unit is a very versatile add-on for the astro-imaging. Using the SX2 and its Star Book TEN controller is a delight. The move away from text-only control to a planetarium style is very user friendly, with the aforementioned two methods of accomplishing GoTo searches. Many users complained about the original Star Book display being too bright even on the lowest brightness settings. The Star Book TEN offers solutions to the brightness problem that plagued its predecessor, with two settings that are available to the user to adjust the brightness and change the contrast of the color display. The choice of which brightness solution to preserve night vision is left up to the user’s preference. The user can also select Night Vision Mode, with the display turning a monochromatic red illumination. The Star Book TEN system allows GoTo searching and tracking with any setup of the mount, meaning precise polar alignment is not necessary for the mount to function. In fact, one could setup the Sphinx mount 90 degrees from the Earth’s equatorial axis, and the Star Book TEN will still function. But doing so is not recommended. Poor polar alignment does not affect the GoTo searching, but can can cause less than satisfactory tracking, especially if astrophotography is being attempted. At least a rough “eyeball” alignment will allow smooth error-free operation of the SX2 and the Star Book TEN. The Star Book TEN firmware does need to be told in the setup routine whether the mount has been precisely polar aligned or not, allowing for the mount to properly compensate in tracking. For more precise GoTo searches and particularly for astro-imaging and astrophotography, alignment using the optional polar alignment scope is recommended. From astro-imaging and astrophotography, the polar alignment precision should be within 5 arc minutes of the true North Celestial Pole. The Vixen polar alignment scope is a 6×20 polar axis scope that features an illuminated reticle and that mounts within the polar axis of the Sphinx mount. It has a built-in Polaris position scale that achieves a quick-and-easy polar alignment within 3 arc minutes of accuracy. To use the polar alignment scope, move the telescope/mount combination physically until Polaris is within the field of the polar alignment scope. Center Polaris in the crosshairs of the polar alignment scope using the fine adjustment knobs located on the base of the Sphinx mount. Two knobs are provided for movement in the X-axis and a single knob in the rear of the base for the Y-axis adjustment. The Star Book TEN requires a minimum of two stars for initial alignment and is capable of utilizing up to 20 stars for alignment purposes. This is up from the first-generation Star Book which allows up to six star alignments. As always, the more stars used for alignment, the more accurate the GoTo searches. I found it was best to choose alignment stars from different sections of the sky that are at least 10 degrees apart. Two alignment stars are needed for initial relatively accurate searches, with the Star Book TEN system GoTo searches improving considerably with four alignment stars. A unique feature of the Star Book TEN is the management of the alignment stars. Under a sub-menu of Settings is “Delete Align Point Data.” When highlighted and selected, the list of the alignment stars used during the observing session is displayed. The user can then delete any old or faulty alignment point. This capability does not exist with the original Star Book. This editing capability proves to be invaluable as stars set and new ones rise as the evening progresses. There are two methods to perform a GoTo search using the Star Book TEN. The first method is to use the stored pull-down lists of Messier objects, NGC and IC objects, solar system system objects, named deep-sky objects, and named stars. In general, this is the most popular method amongst owners of Star Book TEN. An alternative method is to use the directional controls and place the crosshairs on the graphical display on an object of interest, zoom-in on the object to provide a more precise centering in the crosshairs, and then activate the GoTo search from the star map. Both search methods work equally well. It should be noted that adding up the number of objects in the pull-down lists does not come close to the claimed 272,000 objects in the database. The named lists include 109 Messier objects, 7840 NGC objects, 5386 IC objects, and the Sun, Moon, and planets of the solar system. There are 258,977 SAO catalogue stars available, but not all from any pull-down menu. The Star menu only lists named stars. The remaining stars are precisely plotted on the graphical star map display and can be searched and found by using the crosshair search method. The pull down lists of objects include a feature to notify the observer when objects are below the horizon and not observable. A double-circle symbol appears next to the object’s nomenclature when an object can be seen. Of particular interest is the Comet menu item. This is an extraordinary capability that has been included in the Star Book TEN, and a significant upgrade from the first-generation Star Book. From several websites, the orbital elements of newly discovered or recovered comets can be found for input into the Star Book TEN database and saved. Up to 10 comets can be saved in the database. By inputing these orbital elements into the Star Book TEN database, the Vixen SX2 will be able to locate and track comets. Whereas the first-gen Star Book required a cumbersome process of uploading the comet data from a PC to the Star Book, the Star Book TEN allows direct input of the comet data into its database via its keyboard. During the writing of my book, I was able to locate and track Comet Lovejoy. It was fascinating to observe it and actually observe this comet move against the background of stationary stars. The SX2 and Star Book TEN was actually tracking the comet, not just providing right ascension tracking! A Satellite GoTo search capability is also included in the Star Book TEN, with orbital elements entered into the database in a similar manner as the Comet database. Again, up to 10 satellites can be saved in the database. Another unique capability of the Star Book TEN is found in the Moon function. The telescope can be directed to center on specific lunar features. The image of the Moon is displayed on the controller screen, and the lunar image can be manipulated (zoom in or out, moved directionally) to match the view seen through the eyepiece. Lunar features are labeled on the display for identification. No other dedicated telescope mount controller can match this feature. 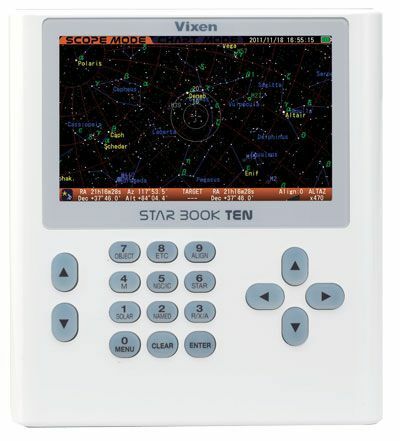 The Vixen SX2 with Star Book TEN comes with my highest recommendation. The SX2 was originally on loan to me from Mr. Star Guy for use in writing The Vixen Star Book Users Guide. But in the process of writing, I fell in love with the technology and quality of the Vixen mount and ended up purchasing it. How’s that for an endorsement! Additionally, the Vixen SX2 and my older SXW have a high WAF rating. What’s WAF? WAF is the acronym for Wife Acceptance Factor! These are very attractive mounts with a quality high-gloss white finish and polished satiny aluminum tripod legs. Vixen has made an excellent effort to give their Sphinx line of equatorial mounts a modern design, devoid of the commonplace cluttered-techie-industrial look that most amateur astronomy gear tends to display. My two apochromats mounted on their Vixen mounts are proudly displayed in our living room when not in use, with no objections from my wife. I have been able to mount my hefty 25-pound Brandon 130-mm apo upon it with ease for visual work. The optional Vixen Half-pier has been fitted to the HAL-130 tripod providing clearance for the OTA from hitting the tripod legs. Currently, as seen in the equipment photo, I have my workhorse Stellarvue 102ABV mounted on my SX2 for both visual and astro-imaging versatility. I’ve taken my setup to star parties, astronomy club outreach sessions, and obviously to my backyard. I still use my original Vixen SXW with the first-generation Star Book with great success, but I have a great deal of fun with my Vixen SX2 setup. James Chen is a retired Department of the Navy and Federal Aviation Administration Radar and Surveillance Systems Engineer. He is author of Springer books, entitled How to Find the Apollo Landings Sites a Guide to the Hubble Space Telescope Objects, and The Vixen Star Book User Guide. He has served as a part-time technical and sales consultant for two Washington DC-area telescope stores for over 30 years. A fourth book for Springer, The Celestron NexStar Evolution and SkyPortal User Guide.